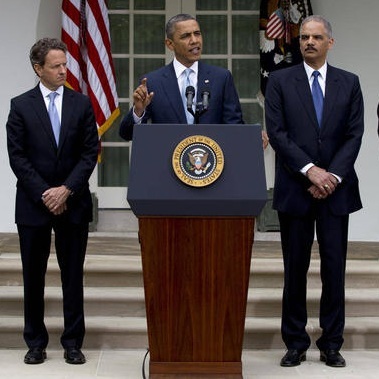 While the Secretary of the Treasury and the U.S. Attorney General are very accomplished positions and both men are certainly "alpha males", Timothy Geithner and Eric Holder are standing beside their President and their boss. The "Fig Leaf" position (aka "Genital Guarding") - with the hands clasped in front of the lower abdomen - is a body language configuration that most of the time speaks to lower confidence, lower comfort levels and "Beta Personalities". Here is an exception though - when standing next to Barack Obama, they wish to show respect for the man and the office. The fig leaf is a very reflexive (and largely subconscious) nonverbal for those standing next to someone who is respected or who, relative to their position, is more powerful. This is particularly true when displayed on such a public stage. Secret # 415: When is it appropriate for the President to Stand in the Fig Leaf?